A group of men with no real background in law or medicine, but blessed with a strong personal interest in women’s bodies, have quietly influenced all of the major anti-abortion legislation over the past several years. The U.S. Conference of Catholic Bishops may be one of the quietest, yet most powerful lobbies on Capitol Hill, with political allies that have enabled them to roll back decades of law and precedent. Note that this is only viewable by those in the UK on the BBC iPlayer click on the large image or link below to go to the iPlayer site. On Sunday February 19th Nicky Campbell presents The Big Questions live from The Perse School in Cambridge. Professor Richard Dawkins is amongst those taking part in the first debate: Is Britain a Christian country? Also, should it be easier to "harvest" human organs for transplant? Taking part will be people on the transplant list, donor families, doctors and medical ethicists. If there's one thing Jon Stewart can't stand, it's public figures making unfair comparisons to Hitler. Unfortunately, during his week off from "The Daily Show" last week, he was presented with yet another Nazi analogy courtesy of Fox News -- this time in reference to President Obama's birth control policy. Bill Moyers Essay: Freedom of and From Religion from BillMoyers.com on Vimeo. In this video essay, Bill Moyers addresses the question of how to honor religious liberty without it becoming the liberty to impose on others moral beliefs they don’t share. The recent debate over contraception coverage in Catholic hospitals and other faith-based institutions brought this question to the forefront, but then something surprising happened — a reasonable, practical, and equitable solution from President Obama that took the political steam out of what some saw as a holy war. Is there really a problem with 'militant secularism' in the UK? PHOENIX - He spent 20 years as a radio talk show host, appearing on Oprah, Larry King, and the O'Reilly Factor among others. His name is Reverend Bob Larson and now he's moved on to his new career -- a self proclaimed exorcist for the Spiritual Freedom Church, based in Phoenix. And believe it or not, people here in the valley are keeping him busy, exorcising what they believe to be demons inside them. But how real is Reverend Larson’s work? FOX 10's Kari Lake reports. Over the next few weeks the site will feature a quick summary of one chapter for those who want more detail, such as the chapter now featured at the top of the home page. By mid-December all chapter summaries will be available for viewing on this site. Dec 19 - Chapter 6 - Sean Faircloth on Scary Politicians: The Fundamentalist Fifty! Shocking! Will keep you on the edge of your seat! Sean Faircloth is doing such important work. There's not a doubt in my mind that if he was (suddenly, inexplicably) zapped back in time to meet Thomas Jefferson, that the Founding Father would clap him on the shoulder and say ‘Thanks.'" -Adam Savage, MythBusters co-host and executive producer. "Faircloth paints a sobering picture, but fortunately, as anyone who has heard his speeches knows, he also has an inspiring and invigorating vision to offer. . . . Readers will finish the book exercised, energized, and eager to join Faircloth in a bold rediscovery of the secular dream of the European Enlightenment and America's enlightened Fathers." -- Richard Dawkins, from the foreword to Attack of the Theocrats! "I've devoted the last twenty years of my professional life to pointing out unscientific assertions that harm or swindle innocent people. It becomes particularly insidious when unsound reasoning is used to justify and apply unjust laws. This book describes this very real problem in American today, then offers a bold plan to do something about it." "What does the erosion of America's noble separation of church and state-the basis of the first secular government in the world-have to do with your everyday life? In this lively and historically grounded survey of the way we live now, the author explains why the thirty-year-old assault on church-state separation affects all of us-from children who are not getting a world-class education in science because of fundamentalist interference with the teaching of biology to soldiers subjected to evangelical proselytizing on military bases. Nothing could be more timely than this reminder that the founders left God out of the Constitution to provide citizens of every faith and no faith the freedom to act on their consciences. We ignore this historic liberty, the gift of America's founding generation, at our peril." Sean Faircloth, is the Director of Strategy and Policy RDFRS U,S.. He is author of the upcoming book Attack of the Theocrats: How the Religious Right Harms Us All and What We Can Do About It. Advance copies are available in the RDFRS store in the link above. Faircloth served ten years in the Maine legislature. In his final term he was elected Majority Whip by his caucus colleagues. At the Secular Coalition for America Faircloth devised and led the Secular Decade strategic plan. Faircloth speaks widely on separation of church and state, the Constitution, and secular strategy. Faircloth served as opening speaker for Richard Dawkins Fall 2011 tour of the United States, and he will do so again in spring 2012. On March 24th at the National Mall in Washington D.C., the largest gathering of secular men, women and youth will take place. It's free, and people are traveling from across the nation (and even overseas) to attend. Featured speakers include Richard Dawkins, PZ Myers, James Randi, Taslima Nasrin, Adam Savage of Mythbusters. Greta Christina, music by Bad Religion and an incredible day that will make history. Russell Blackford at Embiggen Books from Embiggen Books on Vimeo. 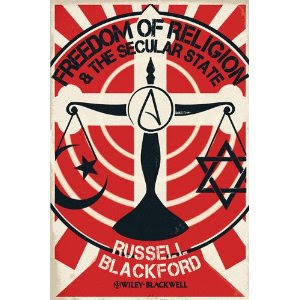 For those that missed our world premier Book Launch of Freedom of Religion and The Secular State with Russell Blackford the other day, here’s the in store video of the evening. 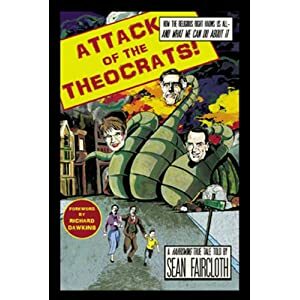 The book "Attack of the Theocrats: How the Religious Right Harms Us All and What We Can Do About It" is available February 2012. Sean Faircloth served ten years in elected office before lobbying for secular government in Washington DC. Learn about "A Ten Point Vision of a Secular America: Restoring the Values of America's Founders"